More than two decades after South Africa ousted a racist apartheid system that trapped the vast majority of South Africans in poverty, more than half the country still lives below the national poverty line and most of the nation's wealth remains in the hands of a small elite. "The country was very unequal in 1994 [at the end of apartheid] and now 25 years later South Africa is the most unequal country in the world," says Victor Sulla, a senior economist for the World Bank in charge of southern Africa. "There is no country that we have data about where the inequality is higher than South Africa." Sulla is the lead author of a new report on poverty and inequality in South Africa. There are various ways to look at economic inequality and South Africa scores terribly on all of them. Income inequality looks at the gap between what the lowest paid workers earn each day versus the salaries of top employees. "The people at the bottom in South Africa, they get wages comparable to the people who live in Bangladesh. It's very, very poor. Wages of less than $50 a month," Sulla says. "If you take the top ten percent, they live like in Austria. So it's very high level even by European standards or even by U.S. standards. And we are talking just about employees, people who are getting paid." And not the super-rich who are earning income from factories or property or other investments. 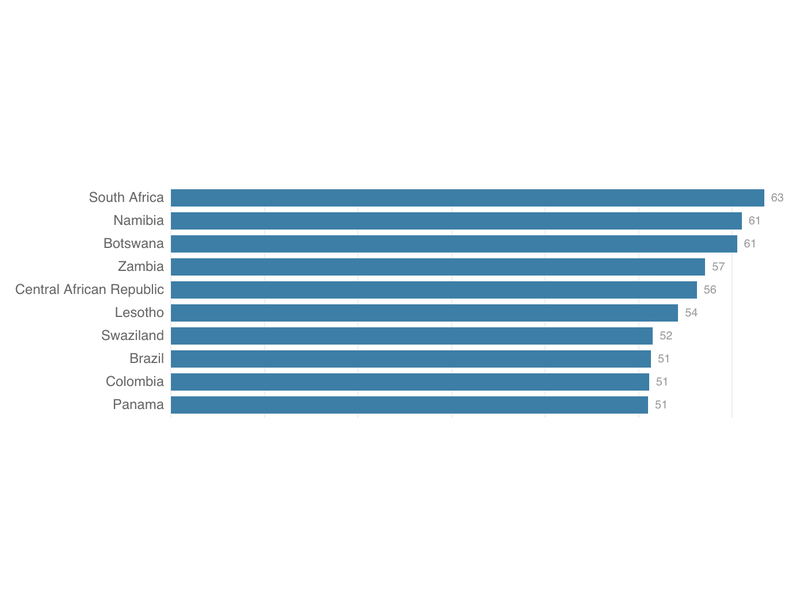 In addition to a huge problem with income inequality, South Africa also has a significant problem with wealth inequality. Wealth inequality looks at the range of a person's assets. So a businessman in Johanesburg might own real estate, factories or other investments while a farmer in KwaZulu Natal might not even own the land she's tilling. This new report from the World Bank finds that the top 1 percent of South Africans own 70.9 percent of the nation's wealth. The bottom 60 percent of South Africans collectively control only 7 percent of the country's assets. "How is that possible? Someone must explain this to me!" exclaims 30-year-old Phiwe Budaza, reached on her cellphone in Cape Town. "How is that even possible?" Budaza, who grew up in the township of Khayelitsha, says inequality is part of life in South Africa. "There's always been a difference between the white and the black but I think it's getting worse now," she says. Before her cellphone battery dies Budaza says she doesn't have a permanent job. She freelances as a photographer and in her words "hustles" to cover her bills. "I work as a bartender and I work for a rental company that rents cameras and film equipment," she says. "It's hard for someone like me who doesn't have a full-time job to survive in Cape Town. The rent for an apartment [in the city] is like three times what I earn in a month." She says she ends up living outside the city, which makes it harder to get to some jobs. Budaza is not alone in struggling to make ends meet every month in South Africa. The nation's official unemployment rate is currently at 27 percent compared to roughly 4 percent in the United States. "South Africa is really facing the triple challenge of poverty, unemployment and inequality," says the former head of the African Union, Nkosazana Dlamini-Zuma, about the report. Dlamini-Zuma is a long-time anti-apartheid activist who now heads up a national planning commission in President Cyril Ramaphosa's cabinet. "We are a relatively rich country but with a lot of poor people," she says. If things don't change dramatically in South Africa, Dlamini-Zuma adds, the country will fail to reach its goal of eliminating extreme poverty (people earning less than $1.90 a day) by the year 2030. South Africa has been focused on trying to bring down poverty and reduce inequality. And it's had some success. Post-apartheid, the government launched a significant Black Economic Empowerment program to promote the transfer of white-owned businesses to black investors. South Africa has invested heavily in social programs including free primary education, a plan for universal health care, infrastructure projects to expand access to clean water and minimum income grants to parents. Sulla at the World Bank says South Africa under the post-apartheid ANC government has been a leader on social programs. "Their social protection programs in terms of different grants and support for the poor are working very well," he says. "This country is one of the best in the world in terms of the efficiency of its social protection system." Yet despite these efforts the number of South Africans living below the national poverty has actually been increasing since 2011. In 2015, 55.5 percent of South Africans or more than 30 million people were surviving on less than $5 a day. Sulla says the lack of progress against poverty is partly due to what he calls "opportunity inequality." Some people have more access to opportunity than others. And the people who've traditionally had wealth and economic opportunities continue to enjoy those benefits. Dlamini-Zuma says the legacy of the apartheid regime still casts a long shadow over the opportunities available for millions of South Africans. "We should not shy away from acknowledging that apartheid was a system that systematically excluded black people from the economy, from skills, from everything. So overcoming that has to be a big part of what we do." She says South Africa's progress will be measured on the progress it makes against the "dehumanizing scourge" of poverty. "Poverty stops us from reaching our full potential individually and collectively," she says. "It's not good to be the country with the highest inequality in the world. We need to get ourselves out of that space. But it's not going to be easy."